This is the fourth in my series of blogs on new and emerging technologies’ impact on higher education. You can see the first, second, and third by clicking on those links. In this blog I’ll be looking at Makerspaces. The NMC Horizon Report 2016 estimates that the time for adoption into mainstream higher education for this technology enhanced learning trend will be 2-3 years. 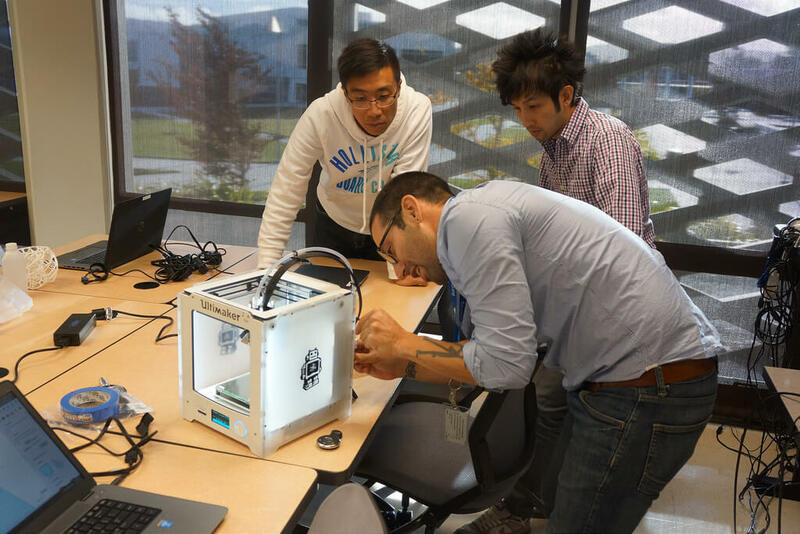 A makerspace refers to an informal community area where people can gather to create and collaborate with access to tools and equipment such as 3D printers, software, and Raspberry Pis. So, imagine a corner of a university library full of desks and electronic equipment where groups of three or four screwdriver wielding people are crowded around electronic devices in various states of intactness. Maybe there are two students staring intently at a half finished 3D printing process and a handful of others staring into the confines of an open desktop PC case. These people have clustered together to make something….or take something apart, but, crucially, they’re learning by doing. The development of providing makerspaces within educational settings mirrors the sharing economy, which relates to the trend of peer-to-peer sharing of access to goods and services organised by online services. The most prominent examples of this may be Airbnb and Uber. From a pedagogic perspective, there is the drive to provide students with a space for them to take part in self-directed learning. Participants engage in a community of practice where they foster creativity, problem solving, and higher-order thinking skills. It also may help students identify interests that will shape their academic and professional careers. Makerspaces have instigated a critical appraisal of existing learning spaces. Think now about how learning materials have been made digital and are generally accessible at the click of a mouse. University libraries, for so long an invaluable repository for information and research, may find themselves needing far less room for the decreasing volume of materials made available there. Therefore, institutions are providing environments that may make better use of that space as they foster creativity and curiosity. These makerspaces provide opportunities for students to move beyond theory and engage in practice which engenders critical thinking and vital interpersonal skills developed through collaborating with others participating in a particular enterprise. There has been a huge Chinese initiative to provide a Mass Makerspace and drive the ‘Maker Movement’ there. The Chinese are no longer happy to be the manufacturers of goods that are designed elsewhere. They want to foster innovation and entrepreneurship within their own country and see makerspaces as prime avenues to accomplish this. The aspect of entrepreneurship is also vital in the US to the development and use of makerspaces. Access to equipment such as 3D printers in the US for people that might not have been able to afford equipment previously is resulting in startups that are manufacturing goods domestically with the knock-on effects locally from service providers which has a positive impact on the economy. Libraries, as previously mentioned, are evolving from repositories to spaces for creation such as is seen with ALA’s Libraries Transform initiative. Makerspaces are providing vital spaces for learners to come together to create. These collaborative learning experiences are resulting in learners developing passions for particular subjects, developing problem solving and interpersonal skills through working as a team and the entrepreneurial benefits that have positive effects on local and national economies. A potentially fascinating knock-on effect of this phenomenon tied with a greater focus on the pedagogic benefits of building communities of practice and socio-constructive learning activities is that admissions may change to reflect students’ aptitudes as makers. Their access to the best universities may in future come down more to what they can demonstrate that they can make as opposed to their GPA and so on. Imagine a future where universities are more focused on bringing talented people together to solve the problems of the present and the future. To create innovative tools that propel societies forward. This aspect of the development of educational institutions as moving away from traditional passive learning and more towards collaborative spaces that engender creative enquiry is something I’ll look at later as a possible unifying theme for the impact of these new and emerging technologies. The next blog, however, will be on Affective Computing.